ESET Smart Security was designed to be complete solution in the field of computer protection against infiltrations and attacks. Eset Smart Security offers more than just a sum of its parts - it is synergy that matters most. If all components are used simultaneously, the effectiveness of the whole program is multiplied. ESET Smart Security unifies all its functions to create a complex security solution. · Improved system of cleaning and deleting infiltrations. The antivirus system now intelligently cleans and deletes infiltrations with no need for user interaction. · Computer scan can be run in background in order to use only a part of system resources. Thus scanning will not affect the performance of your computer and you will be able to work on it as usual. · The resident protection supports archive scanning. · Update optimization, smaller update package size than in version 2.7, more effective management and protection of update files against damage. · Email protection for users of Outlook Express. · Scanning of application protocols HTTP and POP3 (used for Internet browsing and for retrieving email from servers) for infiltrations. · Checking low-level network communication which helps to avoid many of various remote attacks. · Ability to recognize the character of network connections established by various types of infiltrations and ability to automatically terminate them. · Filtering of incoming and outgoing communication based on user defined rules. · Monitoring changes in executable files. · Interactive and automatic mode. The former enables you to create your own filtering rules, the latter filters all communication automatically. · Supports several scanning techniques including the combination of Bayesian filter, virus signatures and user defined rules. · Supports the creation of Blacklist and Whitelist. · Integration with the Microsoft Outlook messaging and collaboration client. · Ability to control multiple messages simultaneously. You cannot download any crack or serial number for ESET Smart Security on this page. Every software that you are able to download on our site is legal. There is no crack, serial number, hack or activation key for ESET Smart Security present here. Our collection also doesn't contain any keygens, because keygen programs are being used in illegal ways which we do not support. All software that you can find here is freely downloadable and legal. ESET Smart Security installation package is prepared to be downloaded from our fast download servers. It is checked for possible viruses and is proven to be 100% clean and safe. Various leading antiviruses have been used to test ESET Smart Security, if it contains any viruses. No infections have been found and downloading ESET Smart Security is completelly problem free because of that reason. Our experts on malware detection tested ESET Smart Security with various spyware and malware detection programs, including fyxm.net custom malware and spyware detection, and absolutelly no malware or spyware was found in ESET Smart Security. All software that you can find on our servers, including ESET Smart Security, is either freeware, shareware or open-source, some of the software packages are demo, trial or patch versions and if possible (public domain licence), we also host official full versions of software. Because we want to be one of the fastest download sites on the web, we host all the software including ESET Smart Security on our servers. You cannot find here any torrents or download links that would lead you to dangerous sites. 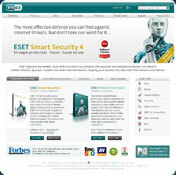 Rate ESET Smart Security 4.0.314!